I really enjoy the strange things that can be found with the internet. Case in point, due to a Google Alert for the term "Ariosto" I discovered an out of print paperback published in 1988. 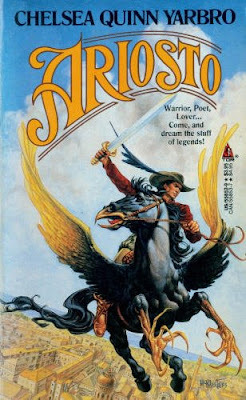 Knowing Ariosto's masterpiece Orlando Furioso as I do, I believe that winged creature on the cover is supposed to be a hippogriff. At first I thought it was merely a winged horse like Pegasus, but after a second look I realized that it had a beak. Perhaps the artist had no idea what a hippogriff was supposed to look like and just winged it. This mythical creature is the cross between mortal enemies griffins and horses, and the front portion is to be that of an eagle. Excuse me, but that is no eagle. That is a horse with a snap-on beak. And look at the legs! Those are horse's legs, but rather than hooves there are talons at the ends. And must I add that eagles do not have manes? Puhleeze. Magna morphs have more realism of mixing species together than that illustration. It reminded me of what my Humanities professor said about why Michaelangelo's female nudes look a bit strange. The artist was not too familiar with the feminine physique and so he basically carved a male's body and then superimposed breasts on the figure. 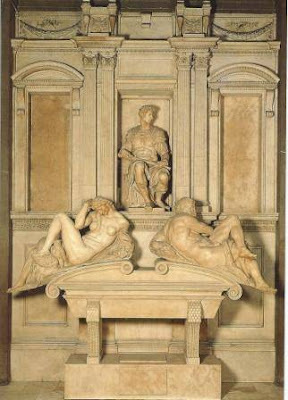 For example here's a crypt Michaelangelo made depicting Dawn and Dusk. I see the figure on the left and think of coconuts. Look at the musculature on the arms, legs and six pack abdominals. It certainly lacks the qualities of Paul Rubens' nudes. I do not know if I shall try to read that out of print book, but if I do I will probably have to find or create a book cover otherwise I will fixate on all its equine weirdness. Perhaps like Michelangelo, Ariosto illustrators didn't have a handy hippogriff model. I'll lend my copy to you in a brown paper wrapper if you want to read it. Get your book out and set the world right! You actually have that book and that they had two cover designs that were similarly bad anatomically. Yes, wrap that puppy up in brown paper wrapping and lend it to me in April if I don't see you before that joint meeting. As for my book...I'm working on doing just that!